Xanax, alprazolam, is a benzodiazepine medication prescribed to treat panic and anxiety disorders for a short period of time. The US Food and Drug Administration (FDA) warns that Xanax can be habit-forming and taking the drug, even as directed with a necessary medical prescription and need for it, can lead to physical drug dependence. The labeling information for Xanax publishes that dependence can be formed even when the drug is taken in small amounts for a relatively short period of time. Dependence severity is increased when higher dose are taken for longer. For example, taking 4 mg of Xanax or more per day for a period of 12 weeks or longer can increase the risk and severity of dependence on the drug. As a benzodiazepine, Xanax interacts with brain chemistry and the central nervous system. Xanax increases the presence of the inhibitory neurotransmitter GABA (gamma-aminobutyric acid) in the brain, which is kind of like a natural sedative. GABA serves to mitigate the fight-or-flight reaction, reducing stress and anxiety, lowering body temperature, and slowing breathing, heart, and blood pressure rates. When a person gets stressed or anxious, all of these functions of the central nervous system go into overdrive. Xanax suppresses them to promote relaxation and reduced tension. Xanax is also a potential drug of abuse, as it can also produce a euphoric “high” when taken outside of the bounds of a legitimate prescription. In addition to increasing levels of GABA, Xanax can also raise the amount of dopamine present in the brain. Dopamine is a neurotransmitter that is involved in feelings of pleasure and emotional regulation as well as movement and sleep functions. Elevated levels of dopamine can make a person feel happy. Combined with the mellow feelings high levels of GABA can induce, this makes Xanax a target for abuse. The National Survey on Drug Use and Health (NSDUH) reports that in 2015, approximately 6.6 percent of the American adult population used an alprazolam product and 1.5 million misused a prescription sedative. Abusing Xanax can increase the rate of drug dependence and potentially lead to addiction. Drug dependence is a physical reaction that occurs when the brain expects Xanax to maintain its chemical balance. Essentially, the brain can no longer keep up with normal levels of neurotransmitter production, movement, and reabsorption. When Xanax wears off, withdrawal symptoms can appear. Xanax withdrawal can be difficult and dangerous. Benzodiazepine drugs are not recommended to be stopped “cold turkey.” Instead, Xanax is typically tapered off over a set period of time, often as part of a medical detox program, in order to minimize withdrawal. Since Xanax suppresses the central nervous system and disrupts the chemical makeup of the brain, it can take some time for the brain to restore its natural order. If Xanax is stopped suddenly after a dependence has formed, the brain can experience a kind of rebound as it struggles to balance itself, and this can be potentially dangerous. Seizures, hallucinations, delirium, high fever, and significant mental confusion can be side effects of severe benzodiazepine withdrawal, which can lead to coma or even possibly become life-threatening. The intensity of the Xanax withdrawal symptoms are directly related to the severity of a person’s physical dependence. For example, a person who has been crushing and snorting large amounts of Xanax every day for months is likely to be more dependent on the drug than someone who took ingested smaller amounts for a short period of time under medical direction. Things like metabolism, co-occurring medical or mental health issues, chronic stress and other environmental factors, other substance use or abuse, genetic aspects, family history of drug abuse and addiction, and additional biological components can also influence drug dependence and therefore withdrawal symptoms. In general, Xanax withdrawal will typically begin when the drug processes out of the body. Xanax is considered to be a relatively short-acting benzodiazepine with a half-life of around 11-12 hours. This means that after about 24 hours of stopping it, the drug is pretty much completely out of the bloodstream. Since alprazolam is classified as a short-acting drug, it is often switched with a longer-acting benzodiazepine during a taper. Diazepam (Valium) is often used. During a taper, Xanax and benzodiazepines are weaned out of the body in a controlled manner under the direction of a healthcare professional in order to minimize cravings and withdrawal symptoms. 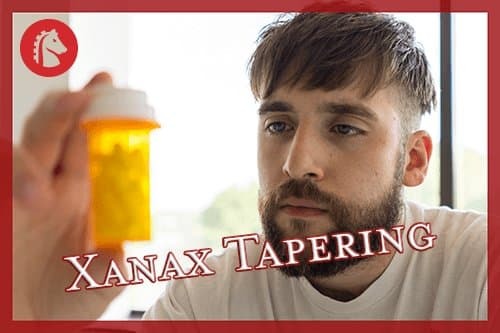 A tapering schedule can help to eliminate some of the more intense withdrawal symptoms and does not present quite the same shock to the body as stopping Xanax suddenly. In addition to tapering off Xanax, other medications, therapeutic techniques, and supportive methods may be helpful during medical detox to manage withdrawal symptoms. The following timeline gives an idea of what a Xanax taper may look like and what to expect during each phase, as published by the National Center for PTSD. Keep in mind that the level of dependence and amount of Xanax taken will influence this timeline. A trained medical professional will need to assess each person individually to decide on the optimal course of action for them specifically. Xanax is often replaced with diazepam at a rate of 10 mg for each 1 mg. For example, if a person was taking 2 mg of Xanax, it is replaced with 40 mg of diazepam. Anxiety, depression, irritability, restlessness, fatigue, and insomnia are common symptoms of early Xanax withdrawal. Dosage of diazepam is reduced about 10-25 percent depending on the person and their tolerance. Dosage may be tapered down from 40 mg to 35 mg, for instance. Withdrawal typically peaks during this time. Symptoms include nausea, dry retching, tremors, sweating, irregular heart rate and blood pressure levels, muscle tension and pain, headache, concentration difficulties, drug cravings, blurred vision, decreased appetite, weight loss, and heightened sensory perceptions and sensitivities to light, sound, and touch. Diazepam dosage is decreased about 25 percent, down to 30 mg a day. Withdrawal symptoms decrease in severity and start to level out. Diazepam dosage is tapered down another 10 percent to 25 mg per day. Dosage of diazepam is now halved from the initial dose, tapered down to 20 mg per day. Dosage is kept steady during this time, and physical withdrawal symptoms mostly dissipate. Psychological withdrawal symptoms, such as anxiety, depression, difficulties feeling pleasure, insomnia, cravings, and cognitive difficulties, are managed through behavioral therapies, counseling, and supportive care. Dosage of diazepam is reduced another 25 percent down to 15 mg per day. Relapse prevention and life skills trainings are taught, as they are beneficial for learning how to manage stress and anxiety in a healthy manner. Diazepam dosage is brought down another 25 percent to 10 mg per day. Individuals may continue to attend group and individual counseling and therapy sessions as well as support group meetings, potentially on an outpatient basis. Dosage of diazepam is tapered down to 5 mg per day, another 25 percent. Each person is different, and the dosage tapering schedule will reflect this as will treatment protocols. The Substance Abuse and Mental Health Services Administration (SAMHSA) publishes that some individuals may experience protracted withdrawal from benzodiazepines, which can persist for a few months after stopping a drug like Xanax; however, with continued abstinence and ongoing support in recovery, these side effects will continue to improve and subside. Medical detox and a comprehensive addiction treatment program can help to manage Xanax withdrawal and minimize instances of relapse for a sustained long-term recovery.